Oscillate Recordings offers professional recordings from two studios, the convenience of a city centre location in Manchester and Knutsford, Cheshire. We have over 400sq ft of space perfect for bands with separate large vocal booth, live room and control room all within line of site from the control room. We have a new Neve Genesys Black desk which provides 8 channels of 1073 mic/line pre’s which has been ramped up with individual Neve 1084 channel EQ’s, VCA dynamics. We also have a further 8 Api and Neve mic pre’s integrated with our Pro Tools HDX MADI system which also connects our extensive array of world class modern and vintage outboard equipment with a Fairchild 670, GML8200 EQ, LA2A, 1176 and many more. Acoustics haven’t been forgotten and all rooms have designed and built by Roger Darcy for optimum recording and listening. To finish off the whole experience we have monitoring by ATC – the legendary SCM300ASL. Microphone selection mics including a rare vintage 1960’s AKG C24, which has to be heard to be believed, as well as Royer, Neumann, AKG, Sennhesier and more. 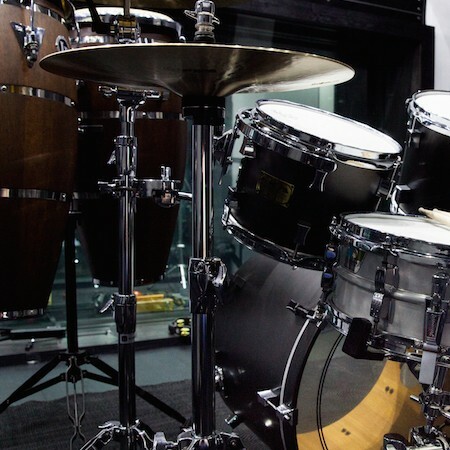 We also have on hire our in-house USA Custom Pork Pie drum kit, Remo congas and a vast array of percussion. Conveniently only five minutes walk from Piccadilly train station. This site is perfect for solo artists or small bands (no drums), voiceovers, audio post production (TV, film, internet), song writing and our music tech courses. We use professional recording equipment with a Studio Mods acoustically treated room, Adam monitoring, with a UAD system and Neumann mics and have a separate acoustically treated vocal booth. We also have a dry hire service so you can bring along your own producer and hook into our system to take advantage of our acoustics and equipment without compromising your own workflow. Both studios have Pro Tools 11/10, Logic X (Pro 9) and Ableton with a vast selection of external plug-ins. A full equipment list of can be found here and some further pictures.